It would have been another 8 hour drive to Jaipur and we were really road tired. The opportunity arose to take a small plane from Udaipur to Jaipur. It was a 45 minute flight and we would have someone meet us at the aiport. Mr Singh would drive the car and meet us later. It all sounded too good to be true, and it was. This was a military airport that let commercial flights in and out until there was a military emergency, which was, kind of, all the time. When we were told there would be a delay of 4 hours, they were sorry but there was nothing they could do about it. Too make up for the inconvenience, they escorted us to the cafeteria for (you guessed it) a grand buffet. Mr. Mumbles Singh stayed with us at the airport most of the time. We had to plead with him (and I mean really plead) to finally leave us. He was actually a very nice guy and felt really responsible for us. We just could never figure out what he was saying. After about 4 hours we were finally called to the security check, the most ridiculous security we’ve have ever been through. It was pre 911 too. All hand luggage was taken away and inspected in a private room, while you were placed in a a different private dressing room and searched. Men searches by men, women searched by women. I was expecting the “please remove your clothing” but it never came to that. When they discovered the AAA batteries in my bag I thought I was going to be taken to the top secret security. “No batteries are allowed” I was told. “What should I do with them?” I asked. There was a united shrug. And so I offered them to the security agent. “Really” he said, totally surprised. “You are giving them to me?” “It’s either that or throwing them into the the trash can”, I told him. He was so thankful. I think Mr Singh arrived to Jaipur before we did. It was a tough day but the road ended at the Raj Villas Hotel; luxury tents and villas. I couldn’t believe we were still in India. We pulled off the road by the discarded washing machines and bags of colorful garbage and once inside the gate, we were all of a sudden in 32 acres of finely manicured lawns and contemporary luxury. We had internet connections, good phone service and all the amenities of a Four Season Hotel. Gretchen called her parents in Pennsylvania. Her dad was sick but the phone call really cheered him up, expecially all the sordid details of my Delhi Belly experience. 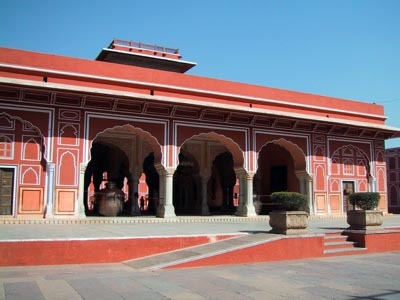 Jaipur is known as the Pink City because most of the city buildings are covered in a pink colored stucco, probably to emulate the red sandstone of other monumental cities throughout Rajasthan. 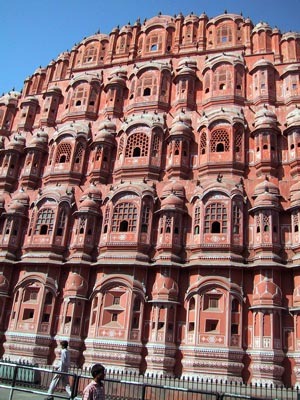 Maybe there wasn’t a lot of red sandstone in Jaipur, or maybe they were just going for a different look. Anyway, this is without a doubt, the most beautiful city we’ve seen in the region. There are wide boulevards, city parks, urban planning and a Royal Palace in the middle of the city. One of the first sights you notice is the “Hawa Mahal”, the Palace of Winds (the photo at the top of page).The building is actually just a facade that was built as an extension to the royal harem. It allowed these Royal Ladies to look on everyday life in the city from behind the windows without being seen. The rest of the Royal Palace is a myriad of ornate chambers, inlaid ceilings, manicured gardens mirrored walls, marble floors, ancient manuscripts, costumes and armor and weapons, including a scissor-action dagger with a release in the handle that would spring open two opposing blades in the wound. It probably really hurt when it was pulled out. The “Chandra Mahal” or Moon Palace is the most beautiful part of the palace with grand carved rooms and finely detailed windows overlooking the gardens. Some of the Royal family still live in a wing of the Palace but for the most part it’s a tourist attraction and a real neck twisting experience. In one hall, off the main courtyard sit the two largest silver vessels in the world (according to the Guinness Book of World Records). These urns were the traveling water supply for the Maharaja Madho Singh II when he visited England.He had to have water from the Ganges River. We still don’t know if he used the water to drink or to bath in. All we were told was he feared the pollutants in the English water. 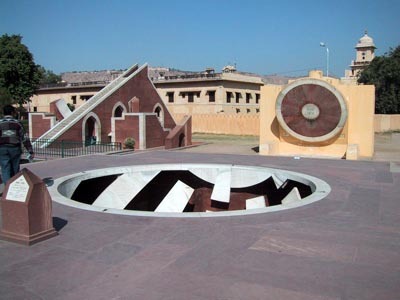 On the roof garden of the Palace is the Jantar Mantar, an 18th century collection of architectural astronomical instruments built to measure time, predict eclipses and monsoons and track the stars and orbits of planets. It looks like a modern sculpture garden but they are more then pretty forms. The are very accurate.The sundial, is still accurat to within two seconds. The following morning Mr Singh brought us over to the Amber Fort where we met up once again with Mr. Dilip Singh, our Jaipur guide. 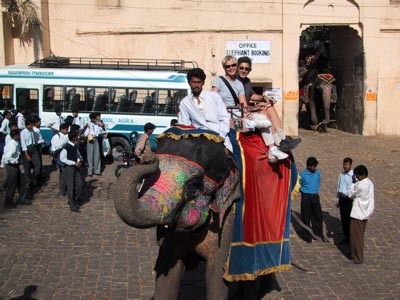 Somehow when I booked the package, I was talked into the “elephant ride” up to the Fort. It seemed pretty touristy but Mr Sunil Puri explained that “it was not kitchy at all.It was a very traditional way to arrive to the Amber Fort in the improtant days”. And so, once inside the Fort entrance, we were escorted to the Elephant cue, which looked like an overzized taxi stand. We were mounted on top of our elephant “Rosebud” and proceeded to climb the hill. It was long and very slow, gracefully falling side to side as the large animal shifted her weight from step to step. I kind of felt like a kid at the zoo. When we got to the top, the driver told us if we would like, we could give Rosebud a tip and soGretchen handed her some rupee and she grabbed it with her snout. The Amber Fort is yet another imposing fortress sitting on top of another imposing hill. It’s amazing that the country fell to the British. It was really well fortified. Oh well, that’s another story. Inside the main gate is a small city; shops, streets and lots of people. 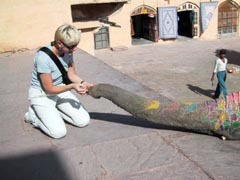 These were the early days of digital cameras and the Rajasthani had never seen such a marvelous invention. 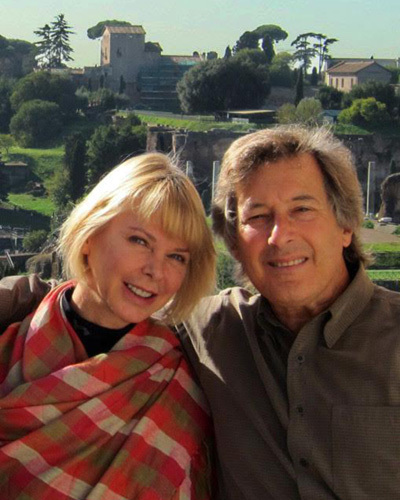 They were so happy to let us make their photographs so they could see the instant results. We started with a small boy and soon moved to a large family. By the end of the session we had created our holiday card for 2000. One of the most popular attractions of the Amber Palace is the “Sheesh Mahal” the Hall of Mirrors. We were brought into the room and Mr Dilip Singh closed the door. He then lit one small candle and the reflecion of the flame off the mirrored walls actually lit up the entire room. Pretty amamzing stuff. Mr Dilip Singh then took us to visit the jewelry shops of Jaipur. This is a very famous part of the world for yellow sapphire. And once again, the salesman was so good, within an hour we left with a 6 carat yellow sapphire for what we thought was a very good price. We later found out that although it was a real sapphire, there was an occlusion inside of the stone due to heating the sapphire to give it a more yellow color. It wasn’t worth as much as we paid for it. Oh well, when we were in Bangkok a year ago, Gretchen got a blue spahhire necklace that was worth more than twice what we paid for it. I guess it all balances out.